Bhí slua mór sa halla inniu idir páistí Naíonán Shoisir , tuismitheoirí , sean tuismitheoirí ,múinteoirí agus Príomhoide na scoile nuair a bhronnan múinteoir Phóil teastas ar na páistí. D'eirigh le Hannah Ní Mhaoláin agus Siobháin Nic Cormaic ó Rang 3 , Múinteoir Chonchúr an chéad agus an dara duais a bhaint amach i gcomórtas DWEC. Maith sibh a chailiní ! 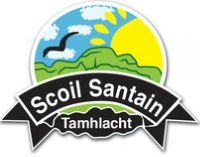 Tá an scoil an-bhródúil as an mbeirt agaibh. Beidh bronnadh na duaiseanna ar Chéadaoin 17ú Mheitheamh ar 3:30 san Ionad Oideachais. 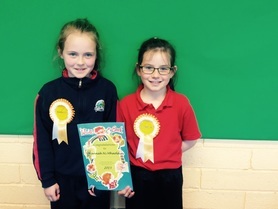 Beidh Siúl ar Scoil ar siúl gach Céadaoin go deireadh na bliana, má sheasann an aimsir. 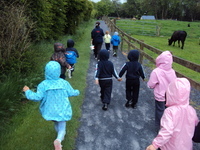 Walk on Wednesdays will be ongoing, weather permitting, every Wednesdays to the end of the school year. 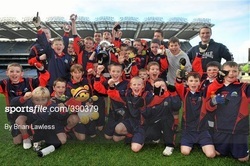 Beidh do pháiste ag dul ar thuras scoile go luath. Tógaigí bhur lón féin libh ar an lá. Your child will be going on their school tour soon. Please provide your child with a packed lunch on the day.